Our Best of the Bull App is now available for download on iOS and Android! Big news for y’all! We just released an iOS and Android app. You can download the new Best of the Bull app for iOS here and for Android here. We’re excited about our Best of the Bull app. It’s simple. It’s easy to use. 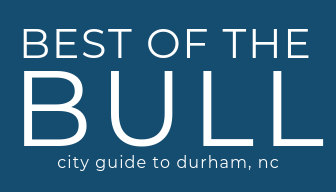 You’ll use it to find in-depth local guides, a curated list of events, explore things to do in Durham, and discover the rewards that you can enjoy with our “Shop Durham” program. It’s now super easy for all you Shop Durham cardholders to find spots to use your card and keep getting exclusive freebies, rewards, and deals at the places that set Durham apart. Browse a complete list of participating businesses and find the ones closest to you on the interactive map. You can even create a custom profile page with a list of your favorite things to do and places to use your Shop Durham card. THANK YOU for following along with us and your support that made this possible. Love you, Durham. You can download the new Best of the Bull app for iOS here and for Android here.